Vendakka/ okra/ ladies finger is the one of the most healthy vegetable easily available. 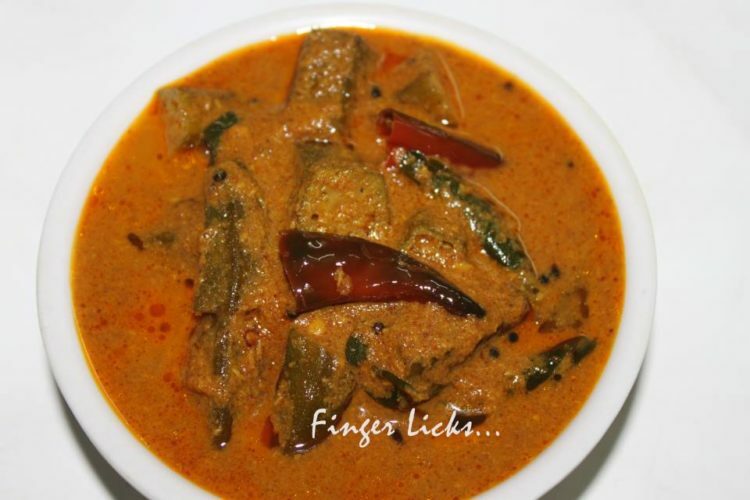 Dishes made with vendakka/ okra/ ladies finger is found to be tasteful as well as healthy. Theeyyal is a common dish found in Kerala. Traditional Vendakka Theeyyal/okra theeyyal has the goodness of natural ingredients. Vendakka theeyyal is a an amazing combination of spices. It is best when served with rice items. In a pan, dry roast the grated coconut, turmeric powder, chilli powder, coriander powder and jeera powder until brown(don’t get burnt, it will spoil the taste). Turn off the flame and keep aside. Soak the tamarind in 1/4 cup water and keep aside. Grind this roasted coconut mix with some of the tamarind water to make a smooth paste. Heat little oil in a pan. Saute the ladies finger with a little salt. When half done, pour the ground paste and the remaining tamarind pulp(if you need more) and water. Cover and cook. Let everything come to boil. Check for the salt and spice. In a small pan, heat little more oil for the seasoning.Splutter the mustard seeds. Add dried red chillies, curry leaves. Pour this seasoning over the gravy. Serve with hot steamed rice.